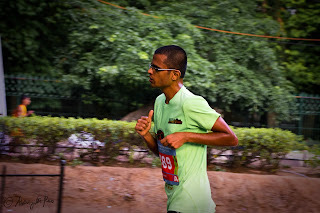 After my successful failures at SPBM and Bangalore Ultra last year, I was looking to get the joy back into my running. In Zen and the art of motorcycle maintenance, Prisig, says “You want to know how to paint a perfect picture? It’s easy. Make yourself perfect and then paint naturally”. Borrowing that thought, to be a better runner, I decided to focus on the better part this year, and the run naturally. And then with a young family, being flexible is paramount. I do 3 quality runs each week – an interval, a tempo and a long run. So when the Golden gate 50k trail run came along, I had my mileage behind me. I have built up towards a 40min tempo now. And no matter how good or bad my tempo days are, I end up doing anywhere between 9.6k to 9.8k, never a 10k. I signed up for the TCS 10k, paying the huge registration fee - @ Rs. 125/km or Rs. 30/min of running, this is my costliest race. Little wonder why TCS world 10k is one of the richest races in the world, no kidding. I was hoping competition and race day fervor will get me under 40mins. Barely a week before, we had returned from a family holiday in Tokyo, with lots of walking and almost no running. The 10k had all the overheads of a marathon, except the distance was so much less. So there was carb loading (I surely over did that), sleep jitters, potty trotty, crowds, getting there, all that song and dance. It was a well organized run. I had no trouble getting out of the blocks from the ‘A’ corral. I knew I didn’t want to wear a GPS to keep track of my pace real-time. I do that with most of my training runs these days, in an attempt to tune into the internal sense of pace. In a wiff, I decided to not carry a stop watch either. It would just save me the trauma of mathematics while on the run – “ok, that is the 6k mark coming up, 22:58 on the clock, that is 3:5x mins/km… ok, I just passed the 6k mark, now the time is 23:40, the avg pace is…”. Who cares. In a 10k race, if you are in doubt, pick up your pace. The strategy for a 10k race is start fast, faster middle and even faster finish. 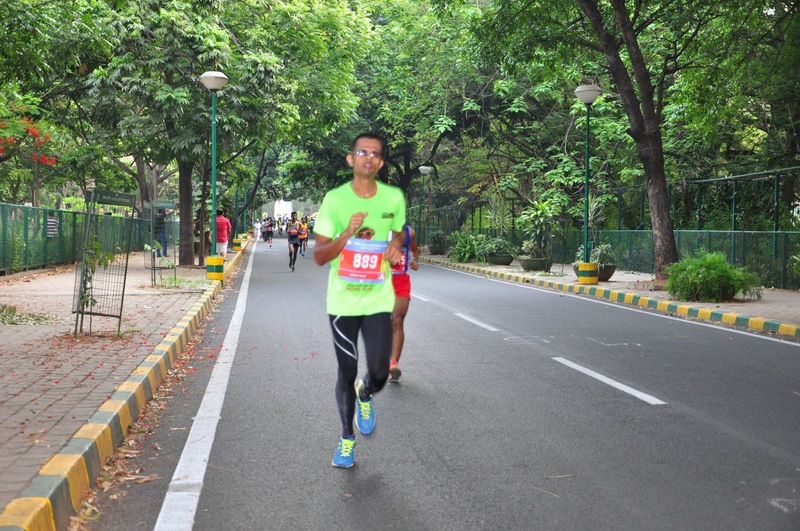 I must admit, during the run, I was tempted to ask a fellow runner or two, “Time yest-aaytu?” And a couple of times, when I felt that I was slacking, I picked up my legs. The fun part was as I turned into the final 300mts stretch to the finish line. You turn out of Cubbon park and can see the large timer at the finish line. With no way to tell, if was under 40mins or over, I strained my eyes (yes, I should have been straining my legs) to see the first digit – 3. But with still some 250mts to go, I can’t be rest assured. Then I focused on the seconds – 05 and counting. Yes. I will get this under 40mins! There is mixed opinion if running blind helps improve timings, but for me, I felt less bound, more free. The effort earned me an overall finish time of 39:33, 48th position in the Open category, 4th in my age group and a PB by over 2mins, worth the price, I guess. Superb timing Manoj! I know what it means and takes to bettering performance after decade of running. You have really transformed. You gave me hope that I too can improve my performance. Keep breaking your PBs race after race! Congratulations!